The Aquatic Warblers song has been dubbed the ambulance in many countries, and thanks to various projects and initiatives the main relics of the hymn have been restored. Now is the time to take long-term treatment – to strive to extend the boundaries of these territories even further, to restore intermediate habitats that can combine it with a jumbo-dwelling habitat network. In the long run, this would allow the birds to migrate from one area to another – reducing the fragmentation of the population, increasing genetic diversity and viability of the birds. This would increase the opportunity for the species to recover altogether – in conditions of unfavorable conditions in one territory, birds could move and move in adjacent areas. This endeavor is long-lasting. 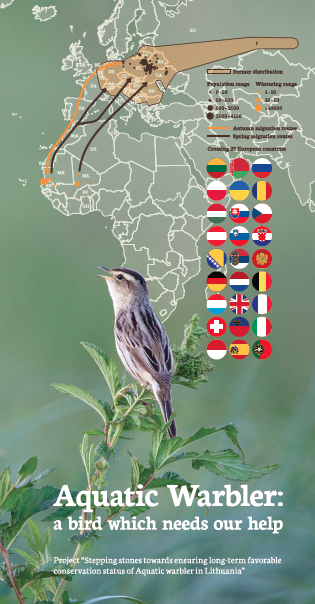 Although the project implementation will take time the specialists of the protection of the Aquatic Warbler are advancing in all directions where the bird is still found (Poland, Belarus, Ukraine, Germany). The project’s abbreviation LIFE MagniDucatusAcrola reminds us of the Grand Duchy of Lithuania (Magnus Ducatus Lithuaniae), where the ancestors of Lithuania and Belarus died for common goals. Now, together with our neighbors, we will strive to secure the long-term protection of the globally threatened Aquatic Warbler (Acrocephalus paludicola). During the 7th year of the project, we will apply pioneering environmental methods that have already been tested but have yet to be implemented. The project is taking place in Lithuania and Belarus, and includes the largest concentration of Aquatic Warblers in the world – Zvaneco swamp. The total area of ​​the project activity is over 20,000 hectares, which is similar to the total area of ​​Kaunas and Panevėžys. In a large part of this territory (about 17,000 ha), the aim will be to ensure an adequate level of water regulation (when dry – water in the meadows when wet through water – pumped water). 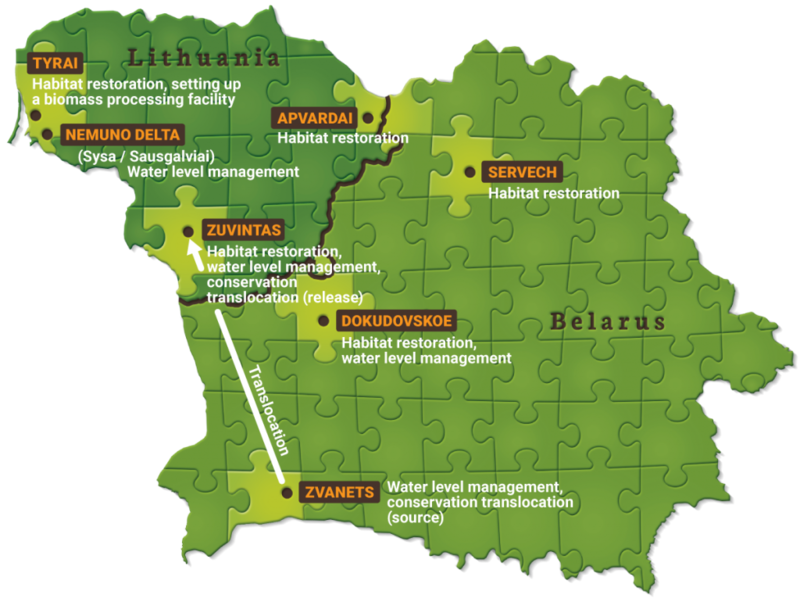 In Lithuania a great deal of attention is concentrated on the Nemunas delta, where the regulation of the water will be carried out. The water regulation will take into account both the protection of the shingles and the farmers (for example, favorable conditions for mowing meadows). Hydraulic equipment will be installed here and polder ducts will be cleaned. In Belarus, an innovative way of rebuilding habitats will be tested – sedimentation of livestock in exploited peatland. Other applicable habitat restoration measures are quite common in nature management – mainly the cultivation of reed and scrub grown. These works are already underway. This method with Aquatic Warbler has not yet been attempted in the world, therefore the task of the project is to test and refine the translocation methodology. Wider application of translocation may be inevitable in the event of an emergency and in order to avoid the complete disappearance of the species. If we encounter such a situation without any experience, it would be too late and too risky to try new methods. The course of translocation is expected to restore the population of Warblers in the Zuvintas biosphere reserve, where only a few males are found and the population is incapable of naturally recovering. We are working closely with European scientists from Cambridge, Greifswald University, and the Royal Society for the Protection of Birds. In order to ensure the long-term protection of the Aquatic Warbler, we will prepare and update strategic documents – species protection plans and nature management plans. In order to create a sustainable system, we care not only for meldine nendrinuke, but also to create favorable conditions for farmers. With this project, we want to solve the problem of farmers – the utilization of the late grass biomass (grass). This problem is faced by farmers who want to protect the children of the honeysuckle, and therefore delay mowing (even until 15 August) and can not use the grass for feeding. In the last project, “The Baltic honeymoon has been damaged” We have achieved that farmers, in the course of their activities in accordance with the requirements of the protection of wild berries, receive benefits that compensate for the losses incurred. In this project, we plan to open a biomass processing plant that could collect and process late-grassy grass into a useful product such as fuel pellets or other products. Several biomass processing plants already operate in the Nemunas Delta and the Pamir region, but their capacity is still insufficient to process the entire biomass generated; they are more likely to accept straw rather than vinegrass. The primary objective of our biomass processing plant is to protect the environment, therefore, it will first adopt biomass from the farming community in harmony with nature. One of the activities will be the creation of a team of specialists who will regularly consult farmers on environmentally-friendly farming. This team will inform them of the needles’ hatchery and will seek to delay haying in these areas. Particular attention will also be paid to children’s education and the knowledge of nature – a special online educational game will be created, editions will be published. We will install informational stands, bird watching, infrastructure, ect. Research on plants, insects, DNA tests, water level measurements, ecosystem services will be performed. The impact of the project will be assessed.